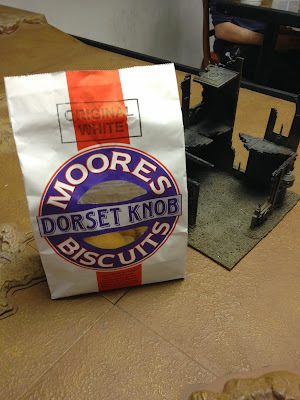 A good friend of mine brought this product back from Dorset to share with all the players in his local games store. I think that it was originally for the obvious jokes, but also as sharing snacks is always fun. Apparently the traditional way to try a Dorset Knob is to sprinkle sugar on the top and to pour tea on it. One bite explains this behaviour - they are not sweet and they are not soft! Tried without any of the above crazy behaviour they are almost like a savoury rusk. They have the same inner honeycomb structure as bread, but with none of that namby-pamby softness. They also taste like they require some kind of topping. One presumes that like most biscuits they will go soft upon leaving out in the elements instead of hard like a cake or bread. They are nice, but the kind of nice that you turn down the second time. 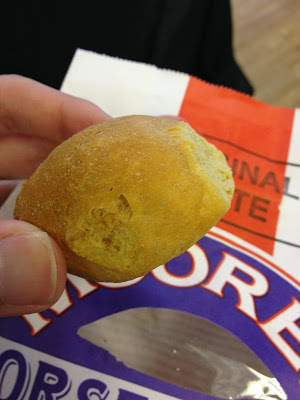 I can understand why scones are more popular than this, but it's always nice to try these regional delicacies. Unless we were tricked by Dorset into eating small, stale cobs in which case - curses! !